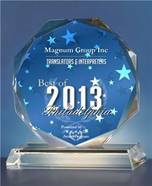 • 2008-2013 Magnum Group recognized by the US Local Business Association with a Best of Philadelphia award in the Translators and Interpreters category. The "Best of Local Business" Award Program recognizes outstanding local businesses throughout the country. Magnum Group’s selection as an Award Winner was determined by its successful multilingual communication efforts through service to its customers and the community. 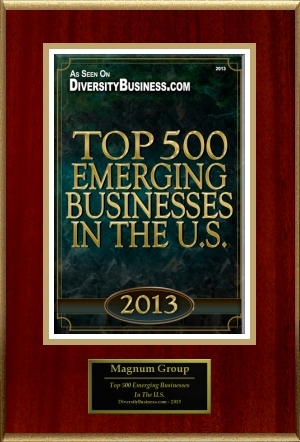 • 2013 - Magnum Group listed in the Top 500 Emerging Business in the U.S. by DiversityBusiness.com. 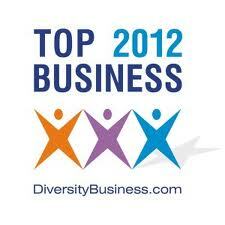 • 2013 - Magnum Group listed in the Top 50 Women-owned Businesses in Pennsylvania. • 2012 - Magnum Group listed in the Top 100 Women-owned Businesses in Pennsylvania. 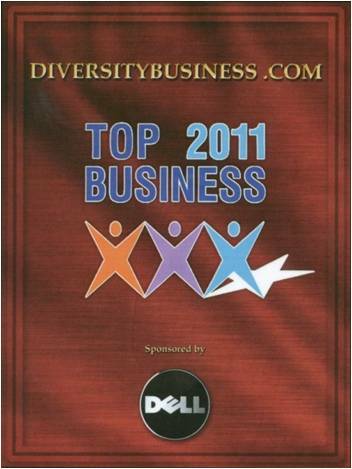 • 2011 - Magnum Group recognized as a “Top Business” by DiversityBusiness.com. • 2007 - In April, Magnum Group received the coveted Liberty Bell Award for its ongoing contribution to Philadelphia´s Emergency Preparedness Campaign. The program´s messages, in both English and Spanish, were created to provide Philadelphians with life-saving public-service information in "their heads, homes, and hands." Magnum Group supported this multicultural initiative with translation and Spanish voiceover services and worked closely with The Star Group, which led the development of the advertising and public relations campaign. Multilingual TV and radio public service announcements are extremely important in any crisis. In case of an emergency, getting these messages out to all communities of the Philadelphia region could save many lives. • 2011 - Magnum Group, Inc. received the Best of Philadelphia Award in the Translators & Interpreters category for the fourth consecutive year. • 2010 - Magnum Group, Inc. received the Best of Philadelphia Award in the Translators & Interpreters category for the third consecutive year. • 2009 - Magnum Group, Inc. received the Best of Philadelphia Award in the Translators & Interpreters category for the second consecutive year. • 2008 - Magnum Group was recognized by the US Local Business Association with a Best of Philadelphia award in the Translators and Interpreters category. The "Best of Local Business" Award Program recognizes outstanding local businesses throughout the country. Magnum Group’s selection as an Award Winner was determined by its successful multilingual communication efforts through service to its customers and the community.